We have been literally “thrown” into the fall semester, and the Equine Science Center has been busy with a variety of projects and events. I’d like to welcome our new Ph.D. student, Ellen Rankins, who joined the program in Endocrinology and Animal Biosciences on September 1. Ellen comes to us after finishing her master’s degree at the University of Florida. 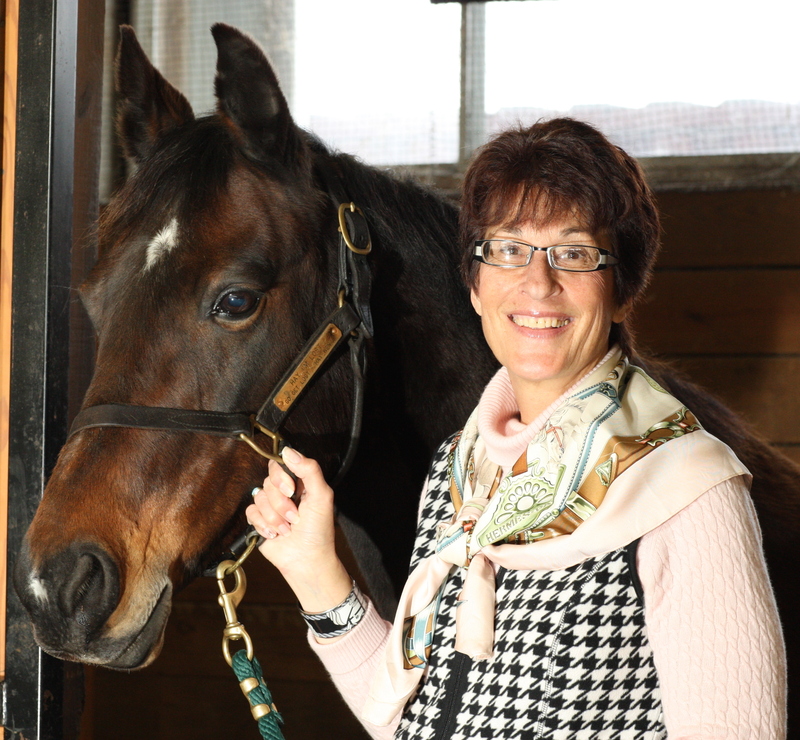 She is interested in Equine Assisted Activities and Therapies and will be working with Dr. McKeever and myself on an exciting new research project involving horses and veterans. On September 17, Center faculty, students and staff joined the Landy family at Freehold Raceway for the 7th annual Open Space Pace. This year we were joined by the Rutgers Seeing Eye Puppy Raising Club which spent the entire day with us. The pups were a HUGE hit with the Freehold crowd and were extremely well behaved. This event provided wonderful exposure for the club and a new training venue for the puppies. On top of all that, the center received a $1,000 check in recognition of its efforts in helping keep agriculture in the Garden State. See our Facebook Photo Album for more pictures. On November 3, the Equine Science Center will host the first wet lab here on campus for the New Jersey Association of Equine Practitioners. Hosted by Universal Imaging and Zoetis, the daylong program will feature hands on training in ultrasound imaging for continuing education credits for veterinarians. See the story and registration information in our Newsletter. Right around the corner is our annual “Evening of Science and Celebration” sponsored by Mid-Atlantic Equine Medical Center. This year’s keynote address is by Dr. Burt Staniar from Penn State University. Dr. Staniar wowed us with his talk about the importance of fiber in the horse’s gut at the Horse Management Seminar last February so we asked him for a repeat performance. And performance it is! Dr. Staniar will use his high power blenders to make a smoothie appropriate for horses and to stress how critical particle size and mastication is to keeping a horse happy and healthy. To learn about the other presentations, and the awards that will be presented, take a look at the event registration page. I also will be offering the Developing Future Leaders for the Equine Industry course in a new format in the spring. In an attempt to attract Rutgers students I will be offering the course on late Monday afternoons from January 28- April in Bartlett Hall on the G.H. Cook campus. Industry folks are welcome to take the course for the nominal fee of $150 for the 10 week course. For more information about the course, please contact me at karynmal@njaes.rutgers.edu. I look forward to seeing you all soon at the “Evening of Science and Celebration”!